Before I start harvesting this for parts for photomicrography - Calopteron discrepens? 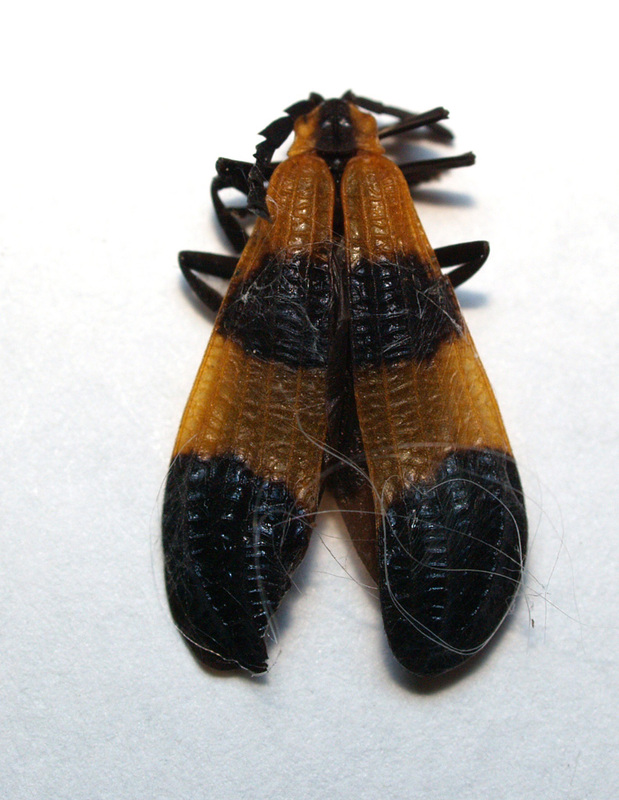 I agree with Calopteron something-or-other, but based on discussion at http://entnemdept.ufl.edu/creatures/misc/beetles/banded_net-winged_beetle.htm I think it's not C. discrepans. The key feature is complete absence of a black band on the elytra along the centerline. I'm thinking probably C. reticulatum, possibly C. terminale. But I don't think we can nail it down based on this picture -- the color patterns are too variable. I assume you're looking in Kaufman again. Based on the discussion I linked above, and the boatload of illustrations at BugGuide.net, it looks to me like Kaufmann switched the illustrations for his reticulatum and discrepens. One last possibly interesting comment... If you look carefully at the names, you'll notice that I've spelled "discrepans" with an "a" everywhere except in referencing Kaufman. The "a" spelling is what I see used by entnemdept.ufl.edu, BugGuide, and Wikipedia. "discrepans" is also the spelling suggested by Google when I stop typing after "calopteron dis". In fact if I bull ahead and type "calopteron discrepens", Google enforces its suggestion by "Showing results for calopteron discrepans" instead -- "About 1,060" of them. But oddly, if I then force the "e" spelling by clicking on "Search instead for calopteron discrepens", it returns "About 1,820 results" -- more with the "e". I have no idea which is the correct spelling, and by whose authority. The takeaway point, if there is one, is that checking multiple sources is always a good idea. Thanks, Rik. Yep, it looks like Kaufman switched the IDs. I did a Google search of "Calopteron photos" and the overwhelming matches appeared to be that my specimen is C. reticulatum. For one thing, the antennae of C. reticulatum in most of the photos are not as finely articulated as those in C. discrepens. In addition, the banding on the wing covers mosre closely matched C. reticulatum. P.S. Gotta get a new bug book. Is the Smithonian better than the Kaufman in your opinion, or should I get the Smithsonian and cross-reference them against each other? I'm not familiar with the Smithsonian guide. My general purpose picture guide is The Audubon Society Field Guide to North American Insects & Spiders. But a lot of what I use is old keyed guides from the "How to Know..." series, either by reference or from memory, then crosschecked and updated using BugGuide and specialized descriptions like the one linked above, found using Google. 1) Any specific name is much more likely to be wrong than right. 2) Most insects cannot be identified to species from a photograph except by a specialist, and often not even then. But that level of identification [to species] is not possible with insects. There are so many of them, the differences among species are often so subtle, and the published information is so fragmentary that it's simply unrealistic to expect to identify most insects to species. For example, North America has about 173 species of blister beetles of the genus Epicauta. We illustrate four of them, but as we mention in the text, there are others that look almost identical to the pictured ones. Our treatment might help you to make an educated guess that you've found an Epicauta, but you won't be able to rule out the other 169 species not illustrated or discussed here!" Among people who care about names, a common practice is to say things like "Calopteron sp., possibly reticulatum". That provides the best available information, while acknowledging uncertainty. For less distinctive critters, the genus or even the family might be in doubt. However, when one is unsure of the specific epithet (almost always) the common practice is to use cf. The abbreviation cf. derives from the Latin verb conferre, while in English it is commonly read as "compare". a specimen whose designation is uncertain because of practical difficulties such as poor preservation of the specimen. Such a usage might suggest a specimen's membership of the same genus or possibly of a shared higher taxon, such as in "Diptera: Tabanidae, cf. Tabanus" where the author is confident of the order Diptera and family Tabanidae, but can offer the genus Tabanus only as a suggestion, and has no information favouring a particular species.